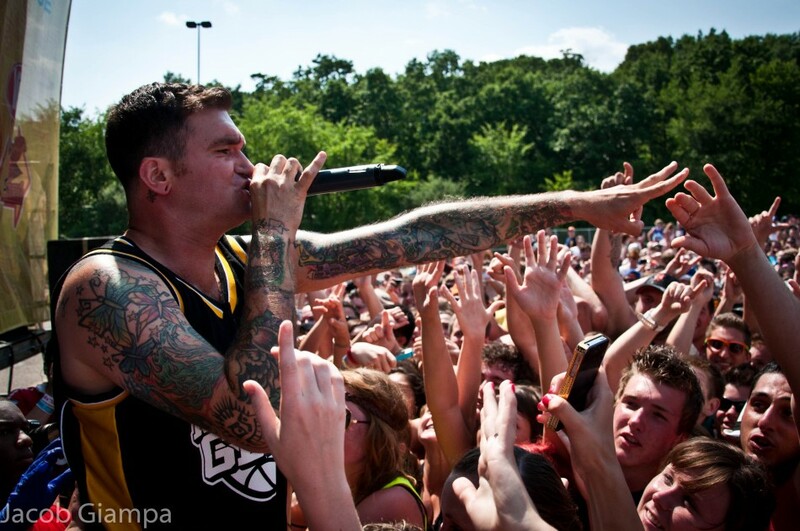 New Found Glory has been taking their "20 Years of Pop Punk" Tour all around the world and recently filmed a live video to share with their fans. Featuring live footage of 5 songs from the band's recent show at O2 Forum Kentish Town in London, the video shot by Paris Visone, showcases the band's seemingly unending energy on the stage echoed by the fans' non-stop sing-alongs. Check out the video of Understatement, Second To Last, Party on Apocalypse, Forget My Name and Hit Or Miss (featuring Dougie from McFly), here. On the "Live in London" video, Guitarist Chad Gilbert shares "Raw audio, raw footage, sick crowd! London we love you! NFG at the Forum in London! 20 Years Of Pop punk! Been forever since we filmed our old This Disaster Live DVD there. So we had to play there again for the anniversary! Check out the footage we snagged! 5 songs and a very loud crowd! The audio straight from the cameras microphone!" Recently, New Found Glory premiered the music video for the island jam "The Sound of Two Voices" exclusively with Billboard. On the track, Billboard shared that the "most un-New Found Glory-sounding song (from Makes Me Sick) was also its best...'The Sound of Two Voices' takes some steel drums and a ska-punk backbone, and rolls a fat one for anyone who thinks they've seen the last of New Found Glory's fresh ideas." Fans can check out the video, along with an exclusive interview from Guitarist Chad Gilbert on Billboard.com. New Found Glory is also excited to be hitting the road again this Fall for the last US leg of their 20 Years of Pop-Punk Tour. Kicking off in Columbia, SC on October 24th, this tour will give fans two full albums each night from the band's impressive catalog including Catalyst, Not Without A Fight, Self-Titled, Sticks and Stones, Resurrection and From The Screen To Your Stereo. The tour will travel to cities like Brooklyn, Cleveland, Salt Lake City, Portland, San Diego and New Orleans before wrapping up in Nashville, TN on December 3rd. All tickets are on-sale and available at http://newfoundglory.shofetti.com/. You can buy Reptar Bars this week!